The third edition of Buenos Aires Fashion Week (BAF week), from 22 to 25 April, in the capital city of Argentina glittered with a light of its own and real inner poise. 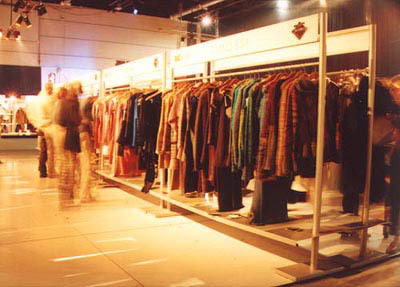 The local fashion fair, which took place at the traditional building of the Rural Society, showed a variety of colorful racks enlightened by young and alternative designer clothes. All of the assistants -visitors, buyers and designers- shared the same code of cool and trendy fashion. The welcome was attractive: TV screens recreating the fashion shows scenery; and the general conclusion of the assistants and organisers turned out to be promising. This enterprise was born in January 2001 and it is supported by Pampa Group, a partnership of two young entrepreneurs, which guarantees the participation of 45 designers. The objective of the event is to become a “catwalk to the world”, introducing new argentinian trends for next winter season, through showrooms meant to generate more closeness between the public and the clothes. Pilar Calegari is one of the Pampa Group directors, affirms that “BAFweek works to positionate Buenos Aires as one of the major design centres of the world”. From designer Javier Estebecorena, from Estebecorena Brothers, perspective “BAF project is growing with us. We have developed a very fluent relationship with Pampa Group because they listen to those who participate and they try to integrate ideas”. The brothers, whose men clothes brand simply carries HE initials, were first interested in design as children, “creating objects, doing some carpentry and paper arts and crafts. Our biggest occupation was searching for new stuff and watching everything”. After that, they both worked at their father’s metallurgical enterprise, until they created their own graphic and industrial design study, at the back of their parents house. Javier, who studied Indumentary and Textile Design at the University of Buenos Aires and nowadays teaches “Expressive Media”, says that “we have a different concept from what is usually made. We don’t make a collection, but develop each garment independently, and it evolves or extinguishes based on people tastes. Our interest resides in anthropometrical, the shape of the human body”. The brothers proposal points to the international market, since “the clothes we make are for the inhabitants of big cities. We are permanently working with both warm and cold garments, for the two hemispheres”. In this edition of BAF, the offer was varied. The diversity of styles gave birth to an original syncretism of textures, materials and endless combinations, transforming the scene into an eclectic landscape. Many of the designers took a strong bet and some of them immersed in wild temerity while defining their proposals not only through clothes but especially through their discourse. Therefore, we could find at the catwalk some inexpressive porcelain dolls, depersonalized and close-fitted into dark suits, hackneyed heroes with a severe gesture, Alices in no Wonderland and gothic meticulousness embroidered in macrame. However, we also noticed a brief rapture of hope through the insistent display of colours, which recreated a languid mixture between hippie litany and old time romantic moods. There were plenty of lunatics with no course or destination, wandering around the catwalk like Victor Hugo‘s miserables. Those itinerant travellers looked like kafkian characters irremediably lost in the voracity of time. This carnival of images reflected the present dicotomy of argentinian designers: should they stay or should they go? Each of them seems to find some way of leaving without actually doing it. The evident option is choosing international expansion though the multiplicity of awards and the promotion which trascends frontiers. The Estebecorena brothers are already selling their clothes at some exclusive stores in the United States. Laurencio Adot is preparing a trip to Miami to open his office there and he’s also considering proposals from Europe, Middle East and Canada. 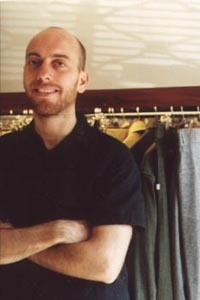 Pablo Ramirez wants to export his next spring-summer 2003 collection. Each of them looks forward to the possibility of staying, based on their almost endless capacity of invention. Many questions appear, for example, in Nadine Zlotogora’s fashion show, where the catwalk resembles a madhouse or an orfanage from which everyone tries to find their way out. Or in Pablo Ramirez collection, whose ending shows a woman in a white dress who is not a bride but the lost Republic he longs to appreciate. From the designer’s point of view, “BAF proves that many things can actually be done. It is almost a miracle”. Ramirez began his professional career in 1994, when he won the 1st. 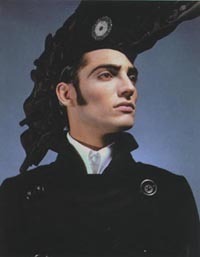 Mention of Alpargatas Contest, ant therefore moved to Paris with a design study of his own. His passion for fashion began in kindergarten, when he used to draw everyone with a hat on. “In this show, he comments, I wanted to capture the dream of a Big Republic. I want to revive the argentine elements. The models, who represent our national heroes, carry on their foreheads a diamond with the color of our flag. I want this national symbol to become a jewel, our rediscovered treasure. I had all these things inside of me but wasn’t aware of them. I made this collection in just one month”. Laurencio Adot, descendant of spanish inmigrants, chooses to think about the situation through nostalgic introspection, and that is what his “Beloved Buenos Aires” colllection is all about. The internationally acclaimed designer, confesses he got his inspiration from “a woman who looks for her own tranquillity through romanticism”. 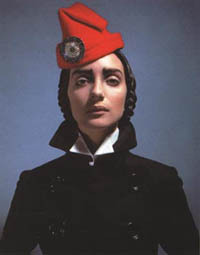 It’s a melancholic reference to Argentine’s “belle epoque”, the golden sensual years. The collection shows “the fantastic story of a sophisticated woman who is not afraid of her sexuality”. Adot tells he “valued leather and black, played with the lightning , the brilliant with a sense of humour”. He describes his preferred elements with overwhelming passion and then he tells “the collection has a strong tailoring basis, a return to the blouse and cocktail style, in sleak and sheer fabrics, for example in the long romantic skirts with a spanish remembrance. This season, leather clothes rule. It is a mix of haute couture and pret-a-porter: childish lace and my own search for past sensations”. Adot addresses to a particular target defined by celebrities and entertainers. However, this season, he decided to turn into a lighter style. “I had been convinced that I had to be big to be taken seriously, but it’s not true. I just have to be myself”. For Adot, “the most important thing at BAF was the energy. The people finally understood that fashion shows aren’t for fat ladies anymore; now they are international”. Since the event took place, a certain optimism is hanging in the air. “There’s so much cooperation between everyone”, Adot says. “We are going to start a new story. There’s a lot left to do yet, but we are following the right path”. We also find the same perspective at the new Ramirez concept, who tells that “like a child, I dream again with patriotic heroes and leaders”. At the same time, he mistically assures that “we are revolutionary by doing things. We have to hang on here and have faith”. About this, Estebecorena assures “this is a great opportunity, this is a very goog and a very bad moment at the same time. It is bad because of the lack of economic resources, but it is good as well, because of the enourmous capacity of human and technical resources. If we connect with each other, we can accomplish big things”. They all agree on the need to look for a common path, doing whatever each of them knows with energy and keeping the hope. 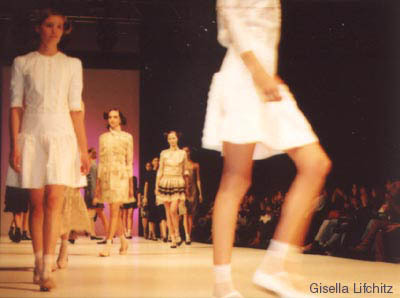 Fashion design nowadays is a space of willing artistic creation, whose main motto resides in the power of imagination. Like Javier assures with a big smile on his face, “people that come to us for the first time get surprised. Because there is so much to tell about Argentina, especially Buenos Aires”. 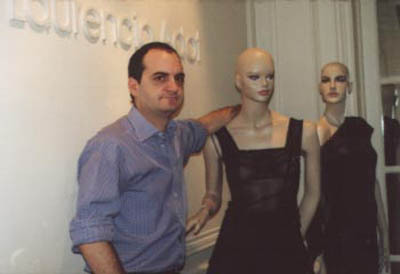 Buenos Aires city is also the place that many designers have chosen to exhibit their work in a micro level. Not everyone concentrates in massive events; they search instead for a modest choice. Some of these movements are independent productions like Nomad Boutique (a group of designers that move from place to place carrying their bags), the Buen Dia Festival (multimediatic space in the open air reuniting musicians and fashion designers) and East West Space (represents new designers, some of them still in college). Gustavo Lento, proffesor at the Indumentary Design University and cofounder of East West Space of Art and Design, affirms that the objective of these less known events is “to be part of a group and strengthen ourselves in order to develop a common force that promotes us as designers”.